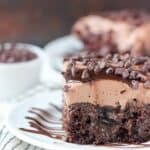 This mouthwatering Sinful Triple Chocolate Poke cake is a chocolate cake, drenched in hot fudge sauce and chocolate pudding and it is topped with a chocolate whipped cream. 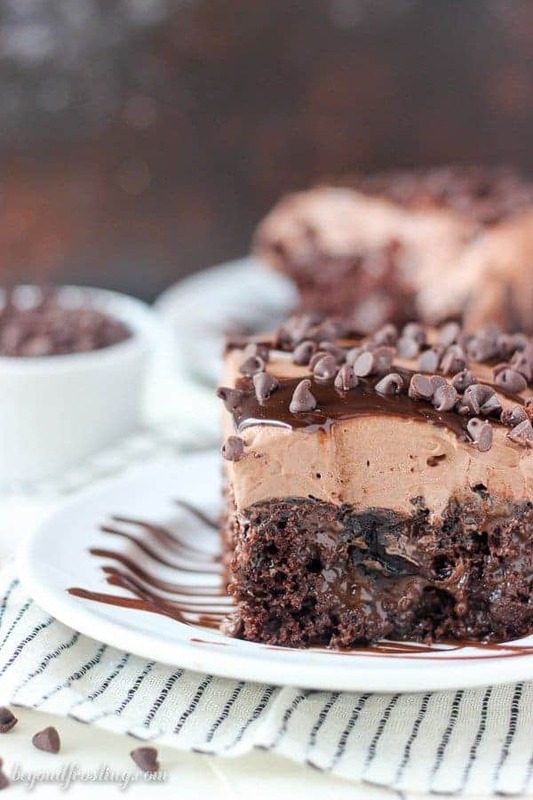 There could not be more chocolate here! 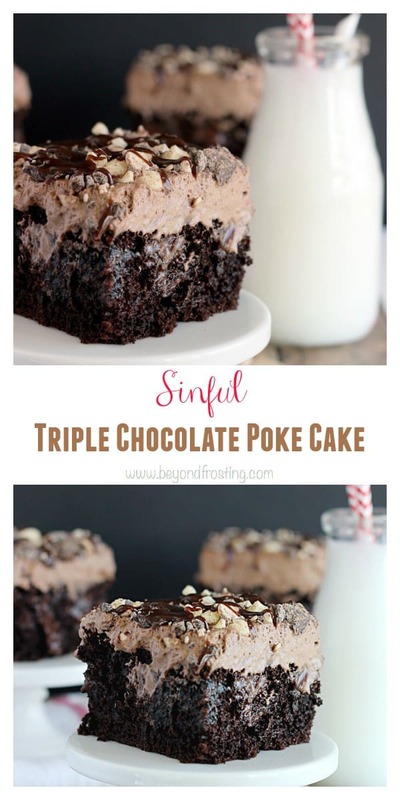 I have a new one for you this week that I call Sinful Triple Chocolate Poke Cake. I am just going to get right into it because it’s that good. This is a homemade fudgy chocolate cake with chocolate pudding and a hot chocolate whipped cream. 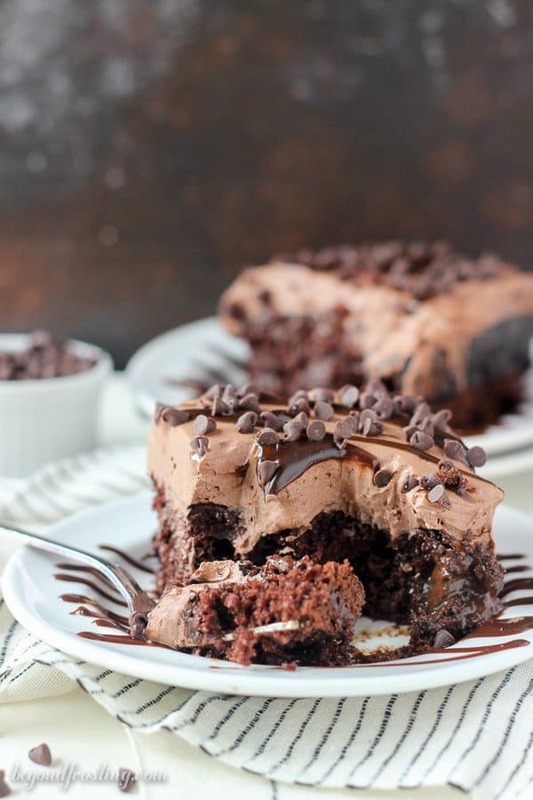 Instead of using your typical sweetened condensed milk, I used a jar of hot fudge that I drizzle over the warm cake and then filled in the holes with a chocolate pudding. 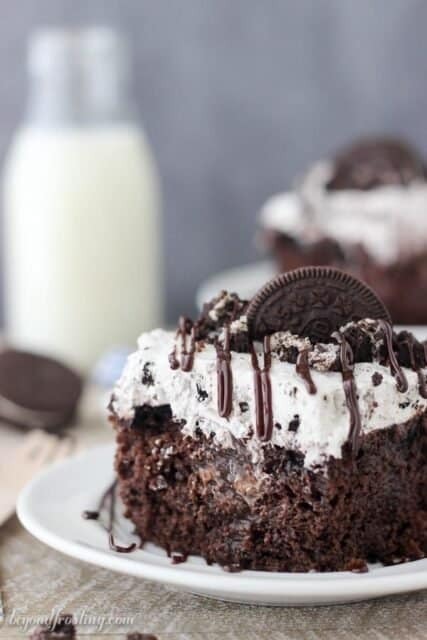 Dreamy is the only way I could describe this cake. Then to top it off, I made a chocolate whipped cream. Whipped cream is SO easy to make. My favorite whipped to make around the holidays is Hot Chocolate Whipped Cream, which I used for this cake. This is one of my favorite toppings. The hot chocolate whipped cream produces a thicker whipped cream, almost a mousse-like texture. It doesn’t have an overly strong chocolate flavor because hot chocolate is not usually rich in flavor. 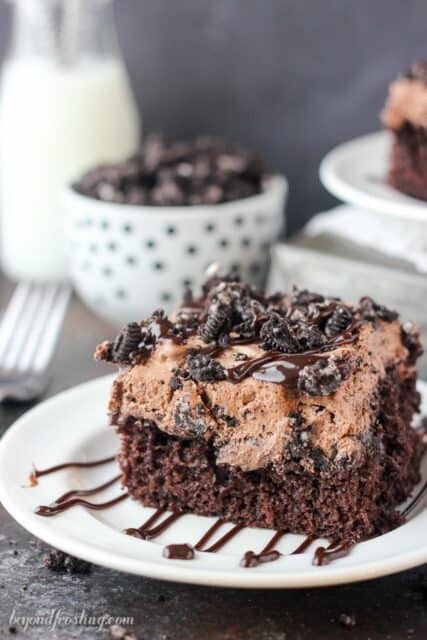 If there is one thing I mention over and over again, it’s that my boyfriend husband really only eat chocolate cake, snickerdoodle, Oreos and Rice Krispie Treats. He really doesn’t eat many of my desserts. So when I made this cake recently so that I could reshoot the photos and make the video (see below! ), he was more than happy to dig right into the leftovers. This recipe is “boyfriend husband approved”. Over the last few years, I’ve learned a thing or two about you guys. Guess what? You love poke cakes recipes too! Every time I share this recipe, you go absolutely crazy for it! I even rounded up 15 of my most popular poke cakes, so you have them all in once place. The original recipe I made in 2013 was for a cake mix version of this recipe.You can still make the cake mix version of this recipe, I’ve included the notes in the recipe for the original cake mix version. You might notice that I use quite a bit of cake mixes for my recipes and there’s a specific reason for that. I believe that you can create something magical with a cake mix, and no one ever has to know you used a box. It is a great way for beginner bakers to get their feet wet. 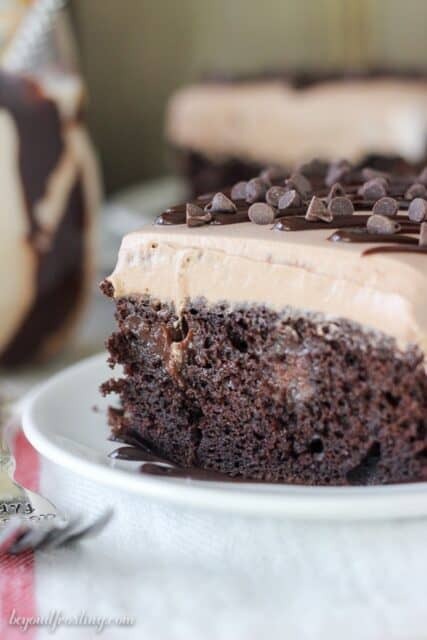 However, I have an amazing Moist Chocolate Cake recipe, and I have since update this recipe to a homemade version. This cake is best served cold, and has to stay refrigerated, but there’s no need to worry about the cake drying out. Between the hot fudge and chocolate pudding in the cake, every bit is the perfect one. Poke cakes make great desserts for parties and potlucks. Although they feed a crowd, I often find my friends go back for seconds. Don’t miss a thing, subscribe to get more recipes in your inbox! In a separate bowl, sift together the dry ingredients. Then add half the dry ingredients followed by half of the coffee and mix just until the flour starts to incorporate. optional: Heat the jar of hot fudge sauce in the microwave for about 30 seconds until you can stir it and thin it out. You may need an additional 30 seconds. Pour the entire jar of hot fudge sauce on the top of cake and allow it to absorb in the cake until cake is cooled. Let set until completely cooled. 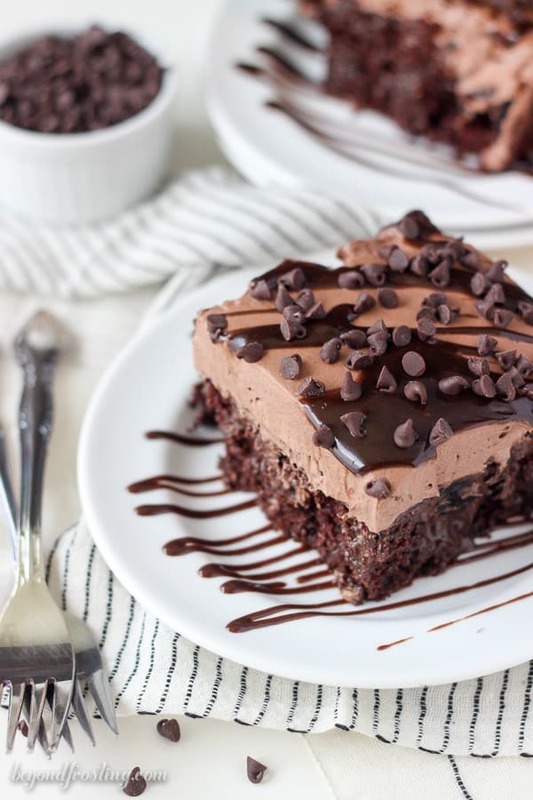 When the cake has cooled, prepare the pudding layer by mixing a package of instant dark chocolate pudding with cold milk. Before the pudding sets, pour it over the top of the cake and put the cake in the fridge to let the pudding set, about 15 minutes. Prepare the whipped cream. Put the bowl and whisk attachment in the freezer for 5-10 minutes to get them really cold (this step is optional, but a common practice I use.). In the cold mixing bowl, beat the heavy whipping cream on medium speed until soft peaks form. Add the hot chocolate mix and increase speed to medium high. Beat until stiff peak form. 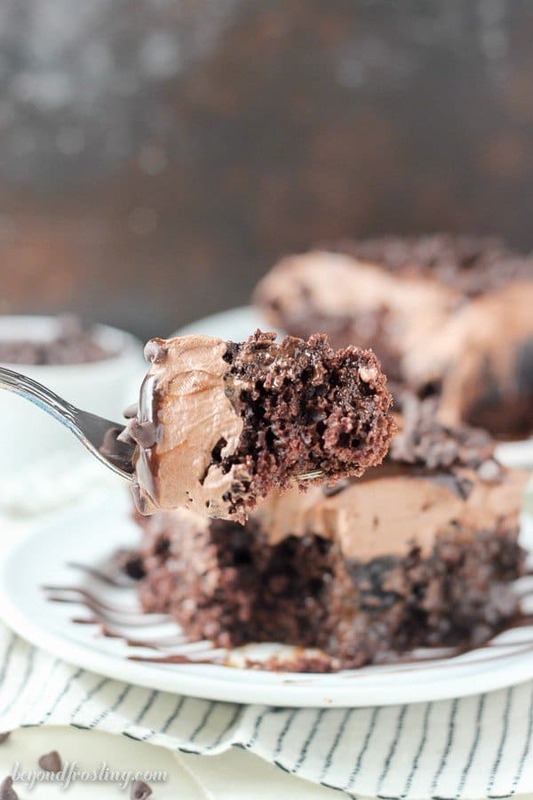 The original recipe was made with cake mix: 1 box chocolate cake mix, 1 box instant chocolate pudding (3.4oz), 3 large eggs, 2 tsp vanilla, 1 cup milk (or water), 1/2 cup vegetable oil, 1/2 cup light sour cream. Mix all ingredients together and make for 24-28 minutes. This is for the cake recipe only. Follow the remaining ingredients and instructions for the filling and topping. Note you’ll need 2 boxes (3.4oz) of pudding if you’re making the cake mix version. 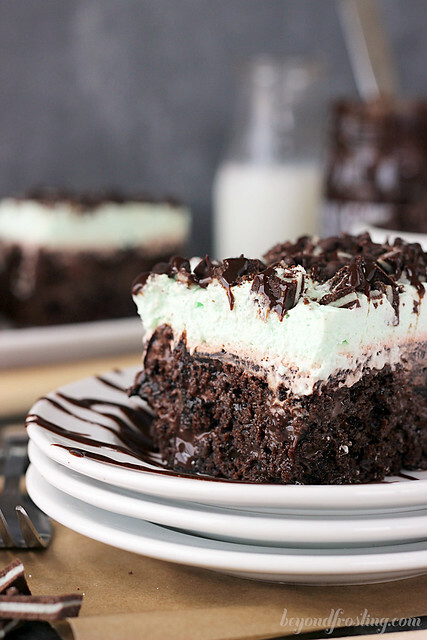 Love this cake and shared the recipe. Quick question: can it be frozen? Friend is making and wants to use for two separate occasions a week apart. Hi Janet! I have not tried freezing this recipe because it has the pudding it in. I am sure it would be fine to freeze without the pudding layer. Looks delicious! I plan to make this weekend. If I go with your original recipe using a cake mix, is there a separate pudding layer? I see you combine the pudding mix with the cake mix to make the cake. Is there a separate link to the original with directions? THANKS! This is for a birthday cake for a colleague who LOVES chocolate. Hi Douglas, for the cake mix version, the recipe in the notes is for the cake only. Follow all the remaining instructions for the filling and topping. So you’ll need 2 boxes of pudding mix for the recipe. Hi Julianne, I was wondering how far in advance you could make this cake? Hi Karen, usually a day or two is just fine! What can you use in place of the coffee? This cake sounds SO rich and delicious!